Jered Weaver is one step closer to becoming an Angel For Life. Sunday night, the Los Angels Angels of Anaheim agreed to a five-year, $85 million dollar contract with their 28-year-old ace. Weaver’s status as one of baseball’s premiere pitchers is certain. Weaver has only once failed to post an ERA below 4.00 (2008) and is now in his second straight season with both ERA- and FIP- marks below 75. He ranks third among qualified starters in ERA- over the past two seasons and fourth in FIP-, among such names as Justin Verlander, Roy Halladay, Cliff Lee, and Felix Hernandez, to name a few. Two of Weaver’s contemporaries near the top of the list supply near-perfect context with which to evaluate his new extension. Justin Verlander signed a five-year, $80 million contract extension with the Tigers before the 2010 season, and the Mariners locked up Felix Hernandez with a five-year, $78 million extension. The qualifier “near-perfect” is necessary since these contracts weren’t all signed at the same time along the arbitration timeline. Verlander and Hernandez each signed their extensions with two years of arbitration remaining, whereas Weaver’s deal covers his third year of arbitration and four years of free agency as opposed to three. As such, we should expect Weaver’s deal to include anywhere from $5-7 million more — essentially, the Angels, Mariners, and Tigers each value their aces equally. The graph measures ERA, but the point hardly changes were we to change our metric to FIP. Over five years of data, it shouldn’t. It’s quite clear the Angels are getting a competitive level of production, particularly in terms of present talent, for their money as the Mariners and Tigers are. And all three of these contracts look to be bargains, as each pays for roughly four wins worth of talent for pitchers establishing performance levels above five wins, at least as judged by Wins Above Replacement. 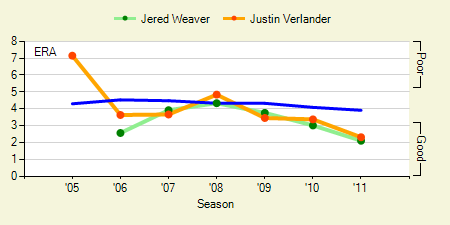 But we can’t ignore the massive age difference between Weaver (and Verlander) and Hernandez. 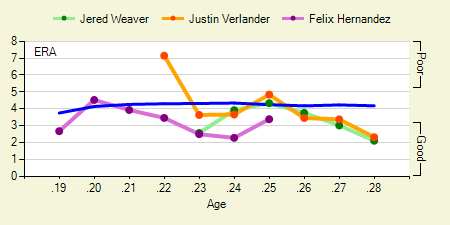 The Angels (and Tigers) are getting a great deal on their aces, particularly early, but they need the results now given the uncertainties with tricenarian pitchers, as the contracts carry the recipients through their age-32 seasons. It’s simply remarkable that the Mariners were able to lock up such a young talent in the 25-year-old Hernandez at a similar value as other elite pitchers who will soon enter their thirties. The fact that the Mariners signed Felix Hernandez to an utterly insane deal doesn’t make the deal the Angels inked Weaver to a poor one, of course. Weaver is one of baseball’s premiere mound talents, and holding that amount of talent in one roster spot without completely breaking the bank is a coup for Los Angeles of Anaheim. And, to go with the purely economic reasons to like this deal, it’s always pleasant for the fans of a team to retain such a talent over a long period of time. The Angels and their fans should derive nothing but joy from this one, as the pairing of Weaver with co-ace Dan Haren should give the Angels a formidable pitching staff for years to come. We hoped you liked reading Angels Lock Up Jered Weaver by Jack Moore! In the bank account of your next owner. Your first arbitration session should start with the total GDP of France.